To help prevent second-hand smoke from adversely affecting non-smokers, not to mention abide by U.K. legislation, it’s wise to provide a smoking shelter in public areas. They’re useful near bus stops, businesses, public buildings and facilities, parks, and other open areas.They’re especially beneficial to have installed near workplaces, where employees often take smoke breaks and need a designated area. Smokers can use these shelters to keep smoke from cigarettes contained to one area, and non-smokers will appreciate them for this purpose. 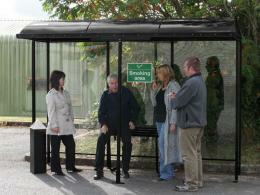 The Smokescreen Open Fronted Shelter will provide a practical place to take a smoke break. The open front provides ventilation while the sturdy sides and roof will shelter smokers from the wind and any inclement weather. You can choose a unit that will fit up to 14 people. The Smokescreen 4-Sided Shelter will provide better protection from adverse weather like wind, rain, or snow with its 4 sturdy sides. 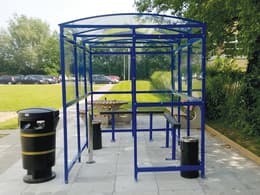 The Traditional Smoking Shelter is a basic option that will provide a sheltered spot for smokers. It comes in 7 colours and a good variety of sizes – the smallest will fit 3-5 people, and the largest will fit 16-18 people. This shelter is a model that offers a small ashtray inside the structure. Two leg types are available that either bolt down or are grouted in. 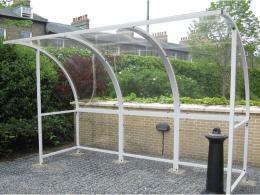 The side panels are vandal-resistant, so this shelter would be ideal for public places. The Holton model is a versatile, modern unit that can be used as a sheltered viewing area as well as a designated smoking area. It’s available in 7 colours and 4 widths, and is made of sturdy materials. Free delivery is offered with all orders from The Workplace Depot. The Smokescreen Open Fronted and 4-Sided Shelters will arrive within 5-15 days. The Traditional Smoking Shelter requires 20-30 days, and the Clear Dome and Holton Smoking Shelters each require 10-15 days. All shelters come with a one year guarantee.